Did the council consult residents when selling off Car-Park? A member of a campaign to save Roman Road Market, has let me know that at tommorow evenings Council Meeting at Mulberry Place at 7:30pm, residents will be asking the council a question regarding the selling off of the Safeway’s Carpark. They would like to know if the council consulted any residents of the area before selling off this much needed carpark for £150,000 so that over 200 flats could be built. If readers know anymore, or would like to contribute please respond through the comments or email..
Connaught have called in KPMG to handle the administration of the company. KPMG are hoping that the majority of workers jobs can be transferred to other companies. What does this mean for the future of Tower Hamlets Homes Major Works programme? Lets also hope that in this uncertain time that these workers manage to find work elsewhere. Reading between the lines though, it would seem this may be just the tip of the iceberg for these type of companies. On another note; sorry to all of you that have been salivating at the thought of my latest articles, *wink, I’m sorry that I’ve not been writing anything, just had other stuff get in the way. I’ll try to pick up the pace again soon. Connaught, one of the Councils Major Works Contractors has suspended share trading today amid concerns for its future…. Sources close to Barbara Brownlee tell me that she has been chomping at the bit at my post on her involvement with Pinnacle Consultants and their influence within Tower Hamlets Homes. I’ve heard rumours she has also consulted legal advice within the council about this particular post made in my blog, demanding that it be taken down. As the post spreads like wildfire within THH, going from email to email, text message to text message, I’m told her frustration is at about boiling point. Today, Tower Hamlets Homes staff recieved their monthly staff newsletter “Home Pages”. Staff immediately alerted me that there was a message from their Director of Housing Barbara Brownlee, directly addressing the post, almost calling for calm within the organisation, at what some feel could almost soon amount to a full blown mutiny. “ You may have seen some blog postings about me and my former role at Pinnacle in the past couple of weeks. Whilst these postings are largely inaccurate (and VERY badly written!) I’m keen to make sure that in the next few months nothing distracts us from us our work in improving services for residents and preparing for our crucial inspection, so I just wanted to set the record straight for staff. I’ve never made any secret of the fact that I’ve worked in the private sector as well as the public sector, and in fact I think that experience helped me develop as a manager. And yes, as everyone knows, we sometimes use consultants and temporary staff to ‘plug gaps’ and bring in specific skills, this is about improving the way we do things, and making the necessary changes in the run-up to inspection. The past year has seen some significant changes which I know a number of you have found difficult, but we have our plan to take us through the inspection and beyond, and we need to make sure we don’t let mad conspiracy theories from an anonymous website get in the way of that. Thanks for the shout out to my blog Barbara, I’m quite flattered really. As for inaccuracies, please feel free to point them out to me and I will immediately change them. Tower Hamlets Council is now refusing to answer a recent “Freedom Of Information Request” regarding Tower Hamlets Homes employment of consultants, employed through Pinnacle psg and Barbara Brownlee’s involvement, who was previously employed by Pinnacle, and now stands as the Director of Housing for Tower Hamlets Homes. The request, which contains numerous questions, was put in over a month ago and still has recieved no official response after repeated requests, the council now actually stands in direct contravention of the “Freedom Of Information Act 2000”, and are now effectively breaking the law. “The Fees Regulations state that this cost limit is £600 for central government, legislative bodies and the armed forces (ie Part 1 of Schedule 1 of the FOIA) and £450 for all other public authorities. On the Information Commissioners Office website, the government department which deals with enforcing the law regarding “Freedom Of Information”, they offer some easily understandable rules on how authorities should treat applications for information under the “Freedom Of Information Act”. 7. What if the public authority needs more time to consider exemptions? “Any information which the public authority is required to release must be disclosed to the applicant within the 20 working day time limit. Where the authority is relying on one or more of the exemptions and is withholding information, it must issue a Refusal Notice (under section 17 of the Act) within the same timeframe, specifying the exemption and why it applies. The request in question is now over 27 working days late, and has also not answered repeated attempts now to even respond to the requesters pleas for acknowledgement. How the council can get away with blatanly disregarding the law in this way just goes to show that there is no oversight within the council itself. The Information office within the council which deals with Information requests is on the 6th floor at mulberry place within the Legal Services Department. So effectively they have no excuse in not understanding the law. Although to be fair if the behaviour of Isabella Freeman, the chief legal ‘scumbag’… “oops sorry”, officer, is anything to go by then no wonder this office seems to have a tendency for breaking the law. 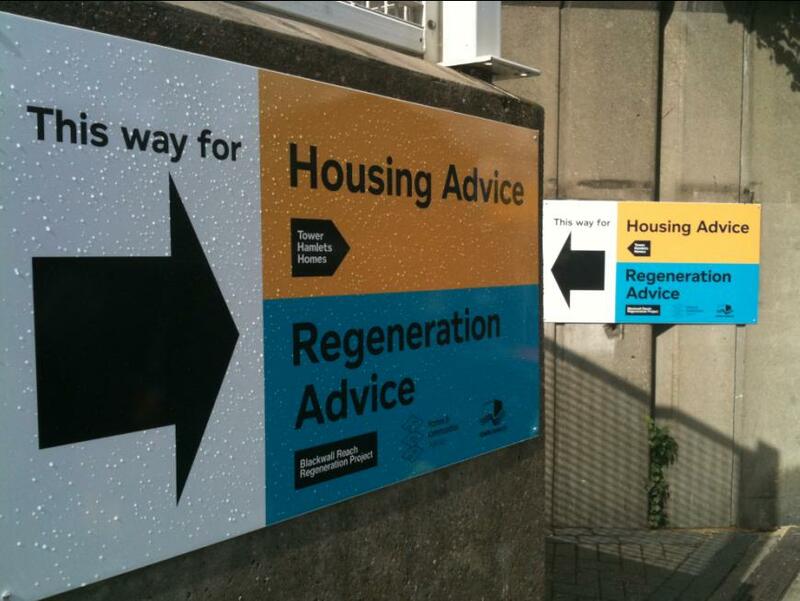 As reported on this blog on June 16, Tower Hamlets Homes seems to be riddled with consultants, and the situation has got worse since the consulting group Pinnacles Director of Consulting Barbara Brownlee resigned from Pinnacle and became Tower Hamlets Homes Director of Housing. Members of Tower Hamlets Homes tell me that they feel Pinnacle staff are now taking over key positions, and that every Tower Hamlets Homes member of staff that leaves under pressure, feeling let down by the council, those positions then get taken over by consultants who then become fulltime employees. Tower Hamlets Homes at the moment seems to be in crisis, with members telling me that a strike may be upcoming with regards to the treatment of office staff, cut-backs and closure of housing offices, and the increased pressure of consultants like Pinnacle and their hench-woman Barbara Brownlee. They argue at the moment that rather than these consultants actually helping residents, the schemes that members have to abide by, make it extremely more difficult to respond and react to residents queries, complaints and calls for help. Residents argue that the new system of closing the local housing offices, has led to a culture of invisibility of staff, and hundreds of complaints are being slung at an already overworked and overburdened workforce, who do not deserve the abuse slung at them on a daily basis. All of this pressure is probably caused by the acts of newcomers like Pinnacle, who daily create mistrust and agitation amongst staff members. Members tell me that there are more and more senior positions, staff with years of history within the local authority feeling sidelined, neglected and abused by the behaviour of the new administration and its culture of confusion that they are now taking early retirement. These positions, members claim, are then in most cases taken up by consultants. “10. What happens if a public authority does not respond within the time limit? Failure to respond within the time limit would be a breach of the Act. The Information Commissioner has a general duty under s47 of the Act to promote good practice. Although the ICO provides an excellent resource for advice and guidance on the FOI and the Data Protection Act, I find it odd that its powers are limited to enforcement notices, and not automatic fines. Even when found guilty of multiple breaches authorities are just offered further guidance on how to respond to requests. I’m sure theres one minister out there trying to fight this, that the ICO should in fact have more power to issue judgments? but then again with the expenses scandals going ahead, their probably lobbying to restrict the ICO’s powers even further. God i get off the mark sometimes. So basically Tower Hamlets is now in complete breach of the Freedom Of Information Act 2000, and theres basically nothing you can do about it, apart from phone a Goverment Department that will probably end up slapping the council on the wrist and then offer them further guidance. No wonder the idiots down at the council think they can get away with ignoring people…. Is Tower Hamlets Homes being slowly and purposefully destroyed from within, in anticipation of a takeover by private organisations? Repeated ‘mantras’ sold to us as ‘great improvements to the service’ or streamlining measures, are just reflections of the fact that ‘Tower Hamlets Homes is facing dire consequences and is just simply running out of money. As far back as August of last year it was reported that ‘THH’ had spent their ‘Major Repairs Allowance – MRA’ for 2010/2011 in anticipation of the promised Decent Homes Cash that Gordon Brown then removed. Our own cabinet in January had emergency sessions to deal with a damning report carried out that highlighted a £4 million pound deficit in the Housing Revenue Account, and a £2.4 million pound overspend by Tower Hamlets Homes. which also had an impact on setting rent levels this year. Go through the cabinet reports yourselves, dont take my word for it. The evidence is right there, since the creation of the much-appraised ALMO service that was going to be a way for the council to improve our services and was the only way government would bring in funding. In reality they have cost us more, and then have simply gone about cutting our paid for services. To blame part of the overspend on “changes in capital financing costs” is just fancy terminology for saying we’ve employed too many consultants. Insiders from THH, tell me that since its creation consultants have been employed more and more, within the organisation. These consultants who come mainly (I’m told) from the ‘Pinnacle Consulting Group’, are highly overpaid, some recieving as much as £700 to £800 pounds per day. Members of THH staff tell me that they seem to come up with ‘crazy ideas’ which regular staff who have been in the job for over 20 years completley disagree with. There have been calls by ‘Pinnacle Consultants’ to require all ‘Neighbourhood Housing Officers’ in fact all staff to adhere to a strict dresscode. No casual clothes, favouring suits & ties over jeans an trainers, which has been deemed ridiculous by regular THH staff as well as Neighbourhood Housing Officers. Many of the residents come from inpoverished communities, and diverse ethnic backgrounds, and seeing a uniniformed officer at their door could make them look intimidating. Some resident-leaders from our ethnically diverse community who have been consulted also fear that elderly residents frequently associate ‘suits & ties’ with police officers in their countries of origin. Since their probably running around like speedy-gonzales, trying to visit each Housing Officers allocation of 700 residents within 10 days, another great Pinnacle strategy more than likely, then its no wonder residents complain about the system. The employee took great insult at the insinuation, and rightly so, they complained to their manager, and the consultant was removed. In what was a highly volatile time for THH, which almost led to revolt this consultant was removed as a way of assuaging the anger of colleagues and friends of the long-term THH employee. Reports of what staff seem to call harrassment are highlighted dailiy, and many staff have resigned from the organisation with many years of service under their belt. One telling me that they cannot understand the direction THH is taking, and that their position was made entirely uncomfortable, so that what they felt was maybe a ‘redundancy’ coming down the line, they chose to take early retirement. Hoping that in the next few months to take positions back with the council, securing their pensions and continuing in working within the system. 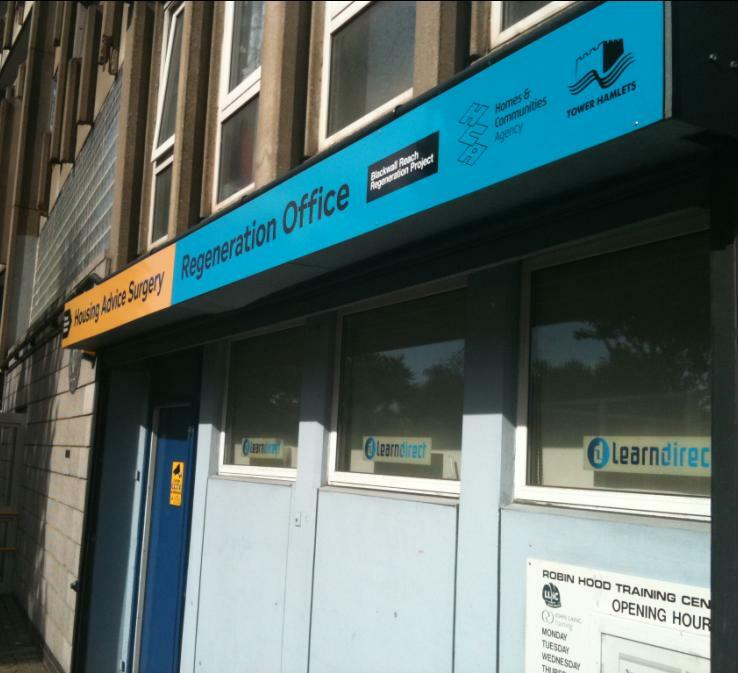 I’m told that each member of staff that has resigned so far has been replaced by a ‘Pinnacle’ consultant who then becomes a permanent member of Tower Hamlets Homes. These members of staff are in Housing officer positions right up to senior level. Sources tell me that they virtually occupy all senior levels. Placed pepperpot fashion throughout the organisation. I’ve done a little digging around and come up with some rather sinister evidence. If what my sources are saying is true, expressing their concerns that ‘Pinnacle’ seem to be taking over, then their must be some sign of this within the system. So why are the the not-for profit company THH set up by Tower Hamlets Council consisting of employees transferred under TUPE regulations, some with over 20-30 years or more of experience in Social Housing, consulting a private social houising manager? “manages all Hackney Council housing services in Shoreditch and the NE Neighbourhood. Hackney Homes 5 Housing Offices are now managed entirely by the Private Sector. Pinnacle are managing 2 of them. John Gibson who left Newham Council and became Pinnacles Director of Housing in 2002, went back to residents in Newham the following year 2003, and was reported in Cabinet Minutes from 23/10/2003 in their report on consultation persuaded council tenants that letting Pinnacle manage their homes would be in their best interests. Barbara’s career started with Lewisham Council, where she was a Housing Advisor providing homeless advice and support. She moved to Haringey Council, where she worked with private sector tenants and landlords to improve and adapt their properties and on to Hackney where she developed neighbourhood services and ran Estate Regeneration for the Borough. This was followed by eight years in the private sector delivering service improvements for a number of housing organisations in the South East. Funnily enough it doesn’t say that she worked in the private sector for 8 years, like her statements on Tower Hamlets Homes Website, but only for 4 years with Pinnacle. Not only did she ‘just’ work for Pinnacle, but she was in fact the ‘Director of Consulting’. How much of her influence and contacts within Tower Hamlets Homes has she used to bring in more and more consultants from the Pinnacle Group. Pinnacle the company that my own contacts within THH tell me that most service personell have huge concerns regarding their motives. Asking me to look into this company i have found various disturbing pieces of evidence that lead me to believe that they are in the process of a corporate takeover of Tower Hamlets Homes, not by accident but by design. It seems with only a days digging around that Pinnacle amongst other groups seem to have their hands in so many different social housing authorities, providing services and in some cases managing the homes. How much is this extra level of public baggage really costing us as tax-payers? So the questions remain are ‘Pinnacle psg’ in the process of taking over the management of Tower Hamlets Homes Housing Offices?. Were they behind the recent closures our local housing offices? that were highlighted on this blog, that required no real consultation, and has aggravated residents. How many consultants are already in the system which already has overspent by around £2.4 million? What percentage of the budget is allocated to these types of organisations? I could go on and on, but these are all questions you as residents must be asking not only yourselves, but your elected members. Anyone out there with more information or just to highlight errors in this post feel free to contact me. Most Council residents in South Poplar are completly unaware of the closing of their local housing office. None were consulted for their opinion on whether they agreed with the proposed closure, which has now been in the pipeline for some months. At a Tenants Federation Commitee Meeting earlier this year; Tower Hamlets Homes Board Members, Iain Lawson & Cllr Alex Heslop were dumbfounded to realise that members of the federation knew of the proposals to close Chrisp Street Housing Office at that time and were being pumped for answers by those present regarding consultation. Jamie Carswell, Director of Strategy and Performance who also attended the Tenants Federation Meeting informed those present that there had been consultation by a resident questionaire that had been sent out. When pushed to reveal figures of returned/eligable questionaires, Jamie’s response prompted those present to calculate that at that time there was something like a 2% response from sent out questionaires. Jamie quite rightly hung his head in shame, and could not really face those asking these very simple questions. To be fair, those present representing ‘Tower Hamlets Homes’ were not expecting this barrage of questions regarding ‘Chrisp Street Housing Office’. The fact is, most members of the meeting were only made aware of the fact that evening in Jan/Feb of this planned closure. Just as non-descript as Jamie’s answer at the Meeting in Jan/Feb. putting forward this as an official answer as to why you closed our housing offices, is completly out of touch of what what people really feel on the ground. Thats right; 7 minutes allocated to each resident or around 68 residents per day. This has to include report writing, travelling time between homes, even travelling to and from the office nearly two miles away. I know this is a rather simplistic, over-stated and rather sarcastic version of the whole affair, but still these statistics offer a rather scary scenario. This promise by ‘Tower Hamlets Homes’ is impossible to really guarantee. I would urge readers that this proposed security hinted at within this promise, is entirely unobtainable in what most would deem an emergency. This is what happens when you let a private corporate mind-set conduct the affairs of what is essentially a social public service. Notice that no dates or times are shown for surgeries. which used to be a Training Centre provided much needed skills to an already impoverished community, and homework clubs, has been taken over by the ‘Blackwall Reach Regeneration Team’ on Tuesdays and Thursdays (these guys are a whole different story), who have deemed to let THH in on the same days, to run housing surgeries. The problem’s faced already and reiterated by those tenants who know about the surgeries, are that the computers at these surgeries do not connect to the Tower Hamlets Home network, and more importantly because these venues are already occupied by other organisations, time allocated to each venues computer usage is already a huge bone of contention, creating tension and arguments between teams, within each venue. Other problems already surfacing are that since there is usually only one ‘Neighbourhood Housing Officer’ allocated for each estate, the reality is that as these ‘officers’ already have a huge caseload of work to get on with (estate visits, home visits, anti-social behaviuor notices, evictions, and all manner of other official distractions), then what we’re finding is, is that unnofficially these surgeries are in fact closed, the majority of the time. Why the low turn-out? 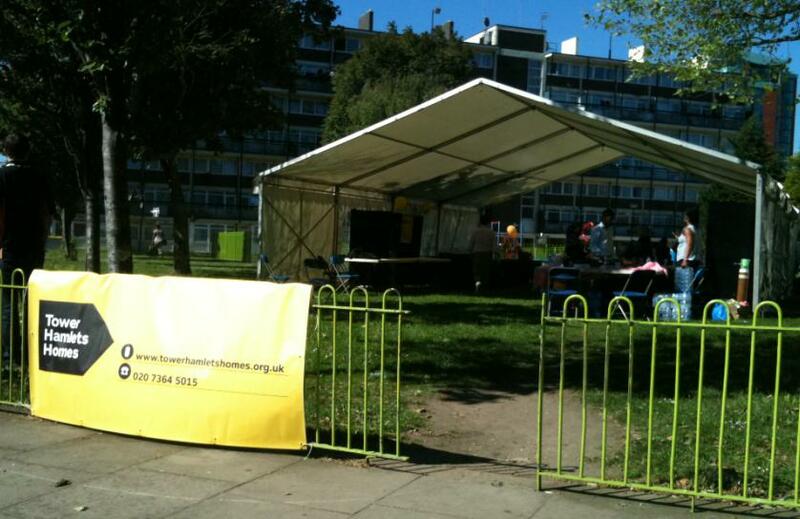 Well maybe this had something to do with the fact that this was due to be held with another event on the grass within the Robin Hood Gardens Estate, and was advertised as much the week before. At the last minute for some unexplained reason, the day before, a small number of virtually invisible amount of posters were pasted up hurriedly around the estates changing the venue. Most residents who actually saw the posters got confused, the others only had their originally leaflet to go by and went to the original venue. This one was set up by the team of volunteers at SPLASH & Neighbours In Poplar, who have been looking after the people of Poplar and providing a support structure independently for over 40 years. The event at Robin Hood went fine with dozens of people attending, face painting, games for kids etc, also attending were the local police force’s ‘Blackwalls Safer Neighbourhoods Team’, dealing with issues surrounding crime and handing out leaflets etc. The Police attending the event were also confused as to why ‘Tower Hamlets Homes – THH’ decided to pull out at the last minute and hold their own disastrous event at a different location down the road. More to the point as I’ve already pointed out, the ‘THH’ event went on from 12:30 to 4:30, and as most Neighbourhood Housing Officers were present, then again the surgeries had to be closed for that event. Leaving those who knew about the surgeries, and the times, and not understanding that there may have been this ‘Action-Day’ were left again with no access to their services locally. Hundreds of complaints are being dealt with by the ‘resident engagement team’ who are having trouble explaining to resident’s the new system, and how in a perfect world (well, maybe the old system) should actually be working.